Starting life back in 2010, Deer Shed Festival has slowly but very surely gone from strength to strength. It very quickly identified its target audience – families with children (year after year, half of those who come to the festival are aged 16 years and under) – and provided them with an irresistible combination of music, arts and science. Having hit upon this winning formula, the key to Deer Shed’s continuing success has been one of quiet evolution. Since that inaugural event – a relatively low-key affair headlined by local heroes The Wedding Present – Deer Shed has gradually expanded into a 10,000 capacity, full-weekend festival with a dazzlingly diverse programme of music, comedy, theatrical shows and well over a hundred arts and science workshops that hold instant appeal to people of all ages and abilities. Given this strong emphasis upon measured, incremental expansion, it does come as something of a shock to returning Deer Shedders to find upon their arrival this year that there has been such a dramatic change to the layout of the festival site. We are not talking minor adjustments here; we are talking about a wholesale, radical realignment of both the arena and its surrounding campsites. From a personal perspective – and in expressing a view reflected by every single person that I spoke to about the subject over the weekend – after an initial reaction of complete confusion and the subsequent struggle to properly find one’s bearings, these changes were greeted with a most unanimous thumbs-up. This rather revolutionary transformation of the Baldersby Park landscape, and with it the creation of more space, has been deftly achieved without losing any of the innate intimacy and inclusivity that lie at the festival’s very heart. And for ringing these bold changes with such great thought and sensitivity, the Deer Shed organisers should be warmly applauded. Taking up where last year left off, Friday begins under sullen skies. But by the time that Blaenavon take to the main stage early evening the sun is starting to puncture the gloom and from that point on all is set fair, both musically and meteorologically. The Hampshire trio play with a smile on their collective face and sparkle with considerable energy and no little élan in what is a most spirited set. And now with the sun high in the sky and the magnificent splendour of the new site layout revealing all of its expansive charm – having the small fun-fair with its Ferris wheel, helter-skelter and swing ride positioned on top of the small rise up above the main stage arena is a masterstroke – there begins as glorious an unbroken run of festival performances I have had the immense privilege of witnessing since Glastonbury back in 2005 when Steve Earle kicked off a dizzying chain of events that also embraced Dave Edmunds, Van Morrison and Brian Wilson. Dream Wife ignites this particular sequence in an In The Dock Stage that is packed to its canvas rafters. The Icelandic-Brightonian three-piece are sheer punk-pizzazz, bristling with their beautifully twisted vision of popular culture and a massive tongue-in-cheek subversive intent. They rattle through a wave of riotous power-pop bangers, with bits of Blondie (‘One Way Or Another’) and Spice Girls (‘Wannabe’) slipped in there for very good measure. And what is, even more, they are very respectful with it, toning down the more explicit content in their hit single ‘F.U.U’. Someone who is also very mindful of this particular audience is Nadine Shah. It is clearly quite a struggle for her, but she does manage to put the brakes firmly on what are invariably the far more colourful elements of her spoken delivery. The potency of her strong political message is not lost, though. Through her words and music, she speaks out passionately and volubly against injustice in all of its forms. And when she is in full, unbridled flight as she is here tonight – backed by a fantastic band featuring Pete Wareham on saxophone – she is as exciting a live performer as there is around today. Whilst Deer Shed still remains a firm supporter and promoter of more homegrown talent, securing the services of Joan As Police Woman illustrates just how far the festival’s musical and creative reach has extended over the years. And the highly acclaimed New York cult act does not disappoint. Her almost metaphysical reading of Prince’s ‘Kiss’ – where the song seems to hover just above The Lodge stage as if in some state of suspended disbelief – is genuinely moving and contributes the first of what turns out to be a number of “Deer Shed moments”. And then Drenge bring this incredible run to a climactic close. Perhaps not everyone’s first choice as a festival headliner, they defy all such expectations. Festooning their stage design with fairy-lit jellyfish and a huge inflatable squid, the Derbyshire outfit fully embrace Deer Shed’s central theme of Making Waves. They even don makeshift breathing apparatus (constructed from hastily prepared rolled-up sleeping mats and plastic tubes) before returning for a richly deserved double-encore of ‘Dogmeat’ and ‘Running Wild’. Everyone trails off happily into the night to the strains of The Beatles‘ ‘Octopus’s Garden’. Saturday starts in a much more sedate fashion courtesy of South London singer-songwriter Matt Maltese, a man with a firm grasp of melodic eloquence and an equally off-kilter view of the world. A couple of songs ‘Like A Fish’ and ‘Guilty’ – both taken from his recently released album Bad Contestant – speak about the virtues of love triangles. And beginning with the Detroit indie-pop musician Anna Burch, Saturday afternoon continues Friday night’s incredibly rich vein of powerful female performers at this year’s festival. She overcomes technical problems; during ‘Belle Isle’ the sound cuts out altogether, but without skipping a beat she almost seamlessly completes the song after a few minutes delay. ‘2 Cool 2 Care’ possesses gorgeous sun-drenched harmonies and ‘Tea Soaked Letter’ oozes a relaxed, kooky charm. First Rozi Plain and then Kate Stables in her familiar guise of This Is The Kit (with Plain on bass guitar) hoist a celebratory flag for the glory of contemporary folk. Just like Deer Shed itself, both artists continue to evolve on their individual musical paths. They incorporate the rootsy and often plaintive echoes of horns into their respective sounds, further exploring the mysteries of psych and imagination. In keeping with the spirit of the occasion, Stables dedicates her performance to both the old oak tree that guards the entrance to Wilderwild, the area of the festival site devoted to the wilderness, nature and the great outdoors, and the art of swingball, that good old Deer Shed festival perennial favourite. She even inspires a mass floss-a-long for her last number. Bisecting Rozi Plain and This Is The Kit and proving that Deer Shed’s musical compass navigates way beyond the outer reaches of blissful serenity is Avalanche Party. Unleashed from somewhere deep within the North Yorkshire moors, they arrive stripped to the waist before bulldozing their way through a chaotic collision of gothic-punk, dark descending chords and nihilistic noise. Given the visual splendour of Public Service Broadcasting’s stage show – a magnificent coordination of lights, sounds and archive film footage and newsreels projected onto two huge screens behind them – it is perhaps best experienced during the hours of darkness. But even in the glistening evening sunshine, nothing can detract from the sheer power and brilliance of this spectacle. They have come a mighty long way since last appearing at Deer Shed five years ago when Wrigglesworth punched an inadvertent fist through his snare drum. On the chorus of ‘Go’ we hear a sound recording of Apollo 11 flight director Gene Kranz asking his flight controllers to be prepared for the powered descent and in what is a wonderfully choreographed routine, the main stage crowd erupts in dance-flash unison. But it is during ‘The Other Side’ when contact is finally re-established between the Apollo 8 crew and Mission Control in Houston and the song takes back off again, where the overwhelmingly emotional moment lies. 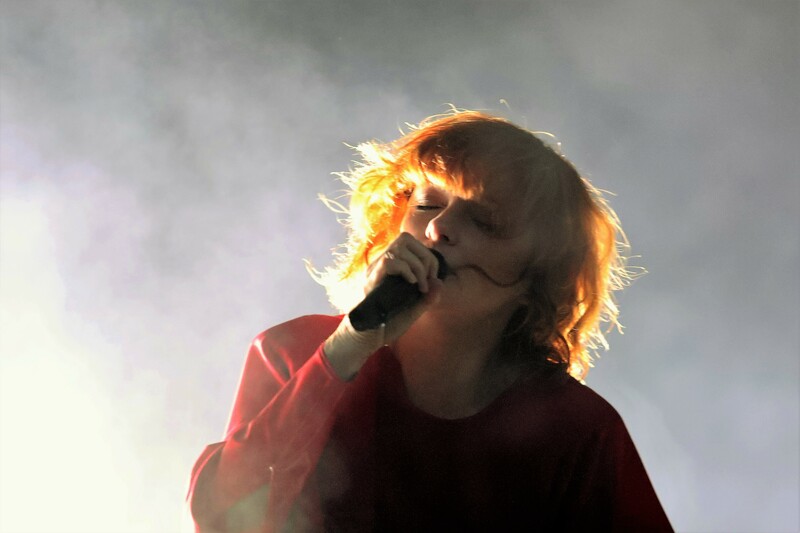 Alison Goldfrapp is another person who seems to be genuinely moved. In what is another remarkable coup for Deer Shed and further evidence of its growing reputation in the festival world, one half of the transformative electronic pop-duo celebrates what is the band’s first ever festival headline appearance with a dramatic exercise in artistic expressionism. Songs such as the concluding ‘Ooh La La’ and ‘Strict Machine’ may well come from the past but here they sound just like the future. My only real criticism of the Deer Shed Festival is that it is all over far too soon. No sooner have you arrived and just begun to immerse yourself in that warm and welcoming Deer Shed groove of familiarity and friendliness, then it seems like it’s time to go. But at least Sunday affords you the opportunity to bid another Deer Shed a long and relaxing farewell. “Goo goo j’joob”. He is the Eigg man. Back again from the Inner Hebrides and not long after having done a stint in the Silent Disco earlier that morning, Johnny Lynch is here as Pictish Trail. He quickly congratulates parents on having got to the last day of the festival without killing any of their children before embarking on an irrepressible journey that mixes irreverent humour and some really rather top tunes in his regular joyful abandon. One of the most pleasurable parts of recent Deer Shed festivals has been the ‘In Conversation’ feature whereby Guardian music critic Dave Simpson interviews individuals from the world of contemporary culture. And this year is no exception. Here he speaks to avant-garde artist Cosey Fanni Tutti and Squeeze mainstay Chris Difford. The former talks candidly about psychological weirdness, growing up in Hull, love and her past life with Throbbing Gristle and Genesis P-Orridge, with the latter reminiscing about the early days of Squeeze, his songwriting partnership with Glenn Tilbrook before playing solo renditions of ‘Cool For Cats’, ‘Take Me I’m Yours’ and ‘Up The Junction’. After having taken something of a sabbatical from live action, Bill Ryder-Jones is back. An often awkward, reticent performer at the best of times, he seems unusually more so this afternoon. But any personal discomfort he may be experiencing – and his songs are riven with feelings of desolation, loss, and reflection – is offset by the sheer majestic beauty of his music. The sound he gets out of that big red beast of a Gibson guitar is truly cosmic and in what has to be the individual performance of the entire weekend, ‘Wild Swans’ falls easily into the category of yet another of those very special Deer Shed moments. “Don’t tell me that it’s over,” Bill Ryder-Jones sings, though in truth it very nearly is. Just enough time remains, though, for returning Deer Shed Festival favourites Field Music. The Brewis brothers are this time accompanied by an expanded orchestral line-up with strings, brass, wind and percussion. Named after the title of the band’s most recent album Open Here, the orchestra adds a huge baroque, occasionally lysergic dimension to Field Music’s exquisite art-rock experimentations. Field Music bid a most grand, yet tearful goodbye to Deer Shed Festival 9 with ‘(I Keep Thinking About) A New Thing’. It is a most fitting finale as there has been much afresh about Deer Shed in 2018. But for all of the considerable changes that have been affected this year – most notably in the layout of the site itself, but also in the expansion of its programme of entertainment – they have done nothing but add to the huge enjoyment of the overall Deer Shed experience. It has surely now achieved the festival organisers Oliver and Kate Jones’ ambition of becoming “a live music/child-friendly utopia” and in so doing has become the brightest, shiniest jewel in the North of England’s festival crown. Deer Shed Festival 9 took place between the 20th and 22nd of July 2018 at Baldersby Park, Topcliffe, North Yorkshire, England. I was one of those returning Deershedders who you may have seen confused and unable to find my bearings for far too long and I’m sorry to say that I didn’t love all the changes (and neither did the people I spoke to). We did all agree the main stage area was brilliant (especially the relocation of the Dock stage) but can’t say the same for the other side. It just didn’t flow… we didn’t like the dead ends and found that it seemed too far to just nip to the tents to do an activity with the children in between performances. This year we spent most of our time at the main stage area or in the sports field (a gate between the two would be great),… aside from seeing a couple of things with the children in Buckends and a mad dash to the Big Top to see James Acaster we didn’t venture over to that part of the site. There was a lot to love about the changes but some aspects that weren’t quite right. Anyway, saw some amazing performances, enjoyed the increase in sofas, have refereed sock wrestling matches numerous times since our return and would recommend Deer Shed to everyone (despite being surrounded by camping neighbours from hell). Our Deer Shed experience wasn’t with small children (though it has been previously); we didn’t camp for what was the first time in eight years; and as the review suggests, focussed almost entirely upon the musical aspect of the festival, so would readily accept that our views are probably not fully representative of the vast majority of those who were there over the weekend. It is therefore interesting to hear a different perspective and from what you have said about the site lay-out in particular I can now see exactly what you are saying. In the interest of balance, it was our first visit to the event and thought it was a fantastic setup. Having a two year old with us meant we’d be spending a fair bit of time in the under 5 area near the big top, but it never felt like a big hike to there from the main stage. No doubt the dry weather made life easier. I liked the idea of the bands on the two bigger stages playing one after the other, it meant seeing more acts than I thought I would.